Sara Pot wears several hats—she’s a writer, a public speaker, a volunteer, and above all, a mother. But most particularly, perhaps, she’s a voice for families who have children with special needs. 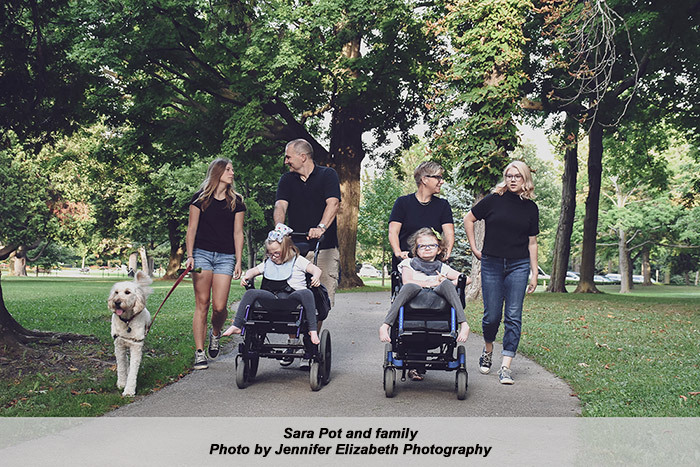 Living in St. Catharines, Ontario, she and her husband Ralph have four girls aged 9 to 16, and the younger two, Rachel, 12, and Janneke, 9, each have complex developmental challenges. Both girls are non-verbal, in wheelchairs and needing constant care. In blogs, articles and talks, Sara delivers a refreshingly straightforward account of the highs and lows of life in her situation. Sara works with Niagara Children’s Centre helping with its online presence and has organized workshops for the annual conference of Empowered Kids Ontario, where she also serves as a board member and provides a family voice for the government relations committee. Rachel and Janneke each attended Niagara Children’s Centre School for four years and have now moved on to a community school.